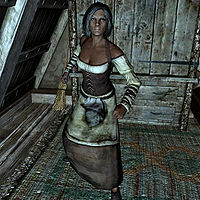 Saadia is a Redguard living and working in Whiterun's inn, The Bannered Mare. She spends her days helping Hulda around the inn, sweeping the floors, cooking meals and serving food and drink to any customers or residents present. She has her own room above the kitchen; it has one bed and a few cupboards. She goes to bed at midnight. At 9am she will work for a long twelve hours, during which she alternates between cleaning, cooking, and serving customers. After 8pm she will stop cooking and focus on serving customers. She was supposed to go listen to Heimskr preaching outside, but doesn't due to an oversight (see bugs). If you sit down in any seat inside the inn Hulda will call out to her to serve you, she will then approach and initiate conversation offering a choice of food and/or drinks from the same merchant chest as Hulda. Prior to her arrival in Skyrim, Saadia, or "Iman" to use her true name, as revealed during her quest, was a noble belonging to one of the most powerful houses in Hammerfell. According to her, when the Aldmeri Dominion spread to her province, she spoke out against the Dominion and was forced to leave the land. She made her way to Skyrim and arrived in Whiterun to hide. She is hunted down as a fugitive by mercenary soldiers known as the Alik'r. However, the Alik'r claim that Iman betrayed Hammerfell to the Aldmeri and is now wanted for treason. The fact that her true name is not Saadia is the only fact not disputed by either side. Both stories are full of holes and there is no hard evidence to support either case. During her quest she will wait in her room and not keep to her normal schedule. After her quest, if you have sided with her, she will return to her normal routine and will never mention the Alik'r again; she will also keep her new name Saadia. If you side with the Alik'r, Saadia will be permanently removed from the game, and no other residents of the inn will take notice, or mention her. Saadia wears barkeep clothes and a pair of shoes. She carries a key to the inn, and after her quest she has a steel dagger equipped (if you sided with her). Saadia will never be able to rent the inn's bed to you. If Hulda dies, Ysolda takes over running the inn. Saadia's body will appear in Whiterun's Hall of the Dead if you hand her over to the Alik'r. Saadia should go outside to listen to Heimskr's preaching from 3pm to 7pm, but her work package at the inn overrides it. This page was last modified on 3 August 2017, at 16:23.